I first saw the trailer for The Odd Life Of Timothy Green in theaters this past Summer. The trailer alone gave me chills and I had water in my eyes. I knew it was a movie that I had to see. It came out and I wasn't able to make the time to go see it in theaters but I am so glad I got the opportunity to review the movie because it was definitely worth a watch. This filmed was cast perfectly. Jennifer Garner and Joel Edgerton did an amazing job with their characters and how can I forget about young Timothy himself played by, CJ Adams. His performance in this movie was fantastic. From beginning to end this movie had me hooked. We watched it as a family and by the end of the movie we were all cuddled on the same couch. I cried, I laughed, I got so emotional, but I'd watch it again in a heartbeat because it was that good. This is definitely one of those family movies you can sit down and watch with your family and a month, a year, a couple of years later come back and still love it. 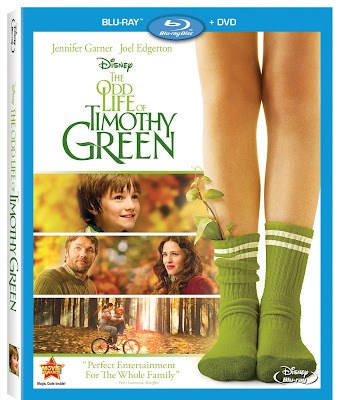 The Odd Life Of Timothy Green is now out for purchase. Make sure Santa brings this to your home for the Holidays! Disclosure: All opinions are my own. I received The Odd Life of Timothy Green for the purpose of this review. No other compensation was received.